The group had been introduced by rapper LL Cool J, as the audience stood to their feet. “To kick off the 52 second annual Grammy Awards, headed down the highway to Hell, for the first time at the Grammys,’ AC/DC!” he declared, being met with enthusiastic cheers. As the camera swung around to the audience during the performance, attendees raised their hands, clapped and sang along, all the while wearing red horns that signified Satan. 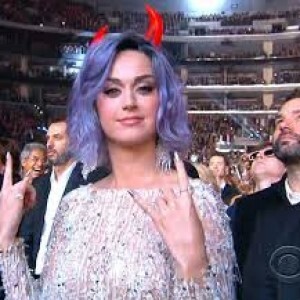 Katy Perry, former contemporary Christian artist now known for her secular hit “I Kissed a Girl,” held her hands up in the air to make the devil horn symbol as the band cranked out the tune. LL Cool J likewise praised the performance as being “devilishly good” at the conclusion of the song. However, questions were also raised in reports about Madonna’s later performance of “Living for Love”, which featured a group of horned men who to some resembled demons or Baphomet. Madonna herself was dressed in a risque red outfit, some of which was stripped away during the song. “It looks like Hollywood’s fascination with demons and darkness is not going to end anytime soon …’And this is the condemnation, that light is come into the world, and men loved darkness rather than light, because their deeds were evil,'” wrote Geoffrey Grider of NowtheEndBegins, quoting from John 3:19. In the film “Hells Bells: The Power and Spirit of Popular Music,” producer Eric Holmberg outlined a number of popular bands who reference Hell and the Devil in their music, including AC/DC, which wore a pentagram on one of their album covers.